Today we continue our Presidential Geography series, a one-by-one examination of the peculiarities that drive the politics in all 50 states and the District of Columbia. Today’s stop: New Jersey, the Garden State. FiveThirtyEight spoke with Patrick Murray, the director of the Monmouth University Polling Institute, and David Redlawsk, a professor of political science at Rutgers University and director of the university’s Eagleton Center for Public Interest Polling. Optimistic Republicans might be forgiven for daydreaming about turning New Jersey into a red state and getting its 14 electoral votes. For the past 20 years, the state has been reliably Democratic in presidential elections, yet it has a number of characteristics that would suggest at least an openness to favoring Republicans. New Jersey has a fairly popular Republican governor, Chris Christie. Its Congressional delegation is evenly split, with six Democrats and six Republicans. 1 Moreover, New Jersey is the fourth most affluent state in the nation, with a median household income of $63,540. New Jersey voters also come overwhelmingly from Republican-friendly territory: the suburbs. 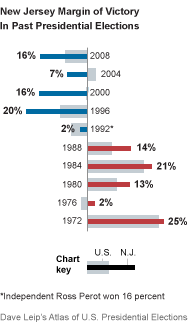 In 2008, 88 percent of New Jersey voters said they lived in suburban communities, according to exit polls. And it was not long ago that New Jersey was a reliably Republican state in presidential elections. Republican presidential candidates carried it from 1968 to 1988, overperforming their national popular vote in every election. But, although the Republican Party in New Jersey is somewhat stronger than in other Northeastern states, the dynamics shaping the state’s politics are more likely to continue moving the state to the left. States often shift politically for two main reasons: migrants and immigrants change the demographic makeup of the state, or a change in policy causes a rift between a party and its voters. In New Jersey, both have occurred, and both have benefited Democrats. First, New Jersey became more ethnically diverse, and minority groups that favor Democrats have become a larger and larger share of the vote. And second, as cultural, rather than fiscal issues increasingly defined the national Republican Party, moderate Republicans and independents in New Jersey left the party in elections for national offices. The second trend is why miles and miles of New Jersey suburbs have translated into underwhelming Republican support. New Jersey Republicanism is exemplified by well-educated, wealthy and most of all, socially moderate voters, Mr. Redlawsk and Mr. Murray said. In North Jersey, traders, lawyers and other professionals who work on Wall Street2 commute there from the affluent suburban and exurban communities in Morris and Somerset Counties. North Jersey also has several large pharmaceutical companies, including Johnson & Johnson, Merck and Bristol-Myers Squibb. The white-collar conservatives, many of them registered independents, who work in these and other industries have shied away from national Republican candidates. “The Republican Party’s veer to the right on social issues over the last couple decades has turned off a lot of moderate voters in New Jersey,” Mr. Murray said. There is a pocket of traditional cultural conservatives in the northwestern corner of the state, which is mountainous and more sparsely populated (the scenery and culture in the northwest seem a continent apart from the industrial landscapes that flash by on the New Jersey Turnpike). In Warren and Sussex Counties, the socially strident, Tea Party brand of Republicanism is more popular than in the suburbs, Mr. Murray said. The Democratic strongholds in New Jersey are based in the state’s cities. At a slight slant, following the New Jersey Turnpike from the northeast near New York City to the southwest near Philadelphia, New Jersey’s most urbanized areas form the core of the Democratic Party’s support in the state. This continuum — from Jersey City, Newark and Elizabeth, to the university town of Princeton, to Trenton and Camden — traverses the main cultural divide in the state, between the north and south. The north is more ethnically diverse. 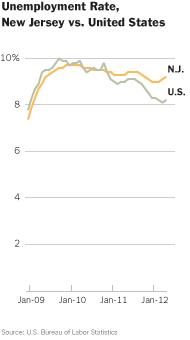 About 1 in 5 New Jersey residents was born in a foreign country. New Jersey is 15 percent African-American, 18 percent Hispanic and 9 percent Asian, the third-highest share of Asian-Americans in the nation. Northern Jersey — land of Giants and Yankee fans — is home to more urban Democrats, and is culturally in New York City’s sphere of influence. In southwest Jersey, Eagles and Phillies fans predominate, and suburban Democrats watch Philadelphia television. Democrats in the southwest are also a little more conservative than Democrats in the north. In New Jersey’s last two gubernatorial races, the counties surrounding Camden — Gloucester, Atlantic, Burlington and Salem — flipped from favoring Jon S. Corzine, a Democrat, in 2005 to voting him out of office in 2009.
atorial elections, helping to elect Mr. Christie, a Republican, in such a blue state. In the past three presidential elections, Atlantic County has been an almost perfect predictor for the statewide vote in New Jersey. Democrats are more numerous in the East Coast’s version of Las Vegas, Atlantic City. But outside the city, there is a sizable Republican presence in retirement communities along the shore and the somewhat rural towns inland. 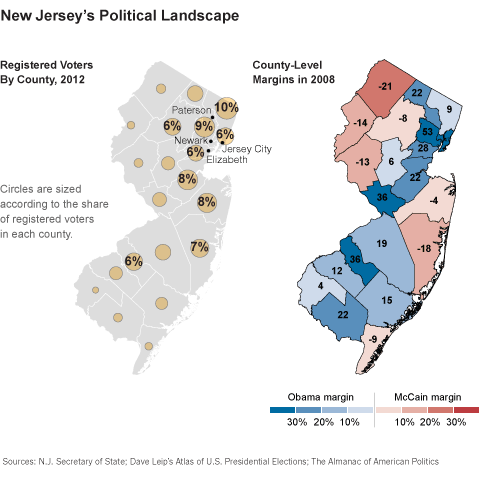 In 2012, Atlantic County may provide an early hint of the final margin in New Jersey. President Obama is still relatively popular in New Jersey, and the FiveThirtyEight model currently gives Mr. Romney just a 7 percent chance of carrying the state. If Mr. Romney does better than Senator John McCain did in 2008 among the many New Jersey residents who work in the financial services industry, it could make the state a little more competitive than it was four years ago. Wall Street support for Mr. Obama has cooled since 2008. But the overall lack of appeal generated in New Jersey by Mr. Romney, who was elected governor of more liberal Massachusetts, illustrates why Republican candidates will have a difficult time wresting New Jersey back from Democrats. Mr. Romney could tap Mr. Christie to be his vice president, but even that would not make a significant difference in how the state votes, Mr. Redlawsk said. 1: New Jersey’s 10th Congressional District seat was left vacant when Representative Donald M. Payne, a Democrat, died in March. 2: The financial crash devastated New Jersey’s tax base, partly because so many residents work in the financial services industry.